The First Amendment to the U.S. Constitution grants religious freedom as an inalienable right. Indeed, intolerance is antithetical to our nation’s founding principles. Despite this mandate, there has been an alarming escalation of religious intolerance in our country recently, inflicting two sets of victims: those who are impugned because of their beliefs, and those whose fears are exploited by false, incendiary, misguided rhetoric. 1. Advance Interfaith Cooperation: We believe that our nation’s founding commitment to democracy with religious freedom demands that we pursue interfaith cooperation; this includes respect and accommodation for diverse religious and secular identities, positive relationships between those of different religious and philosophical views, and a commitment to working together across lines of difference to advance the common good. 2. Marshal Religious Diversity: We believe that Atlanta holds a special place in U.S. history as well as contemporary and future American and global spheres. The religious diversity at the heart of this city propelled the Civil Rights Movement and continues to stand as an asset that can enhance our region’s ability to respond to human rights challenges with innovative solutions. 3. 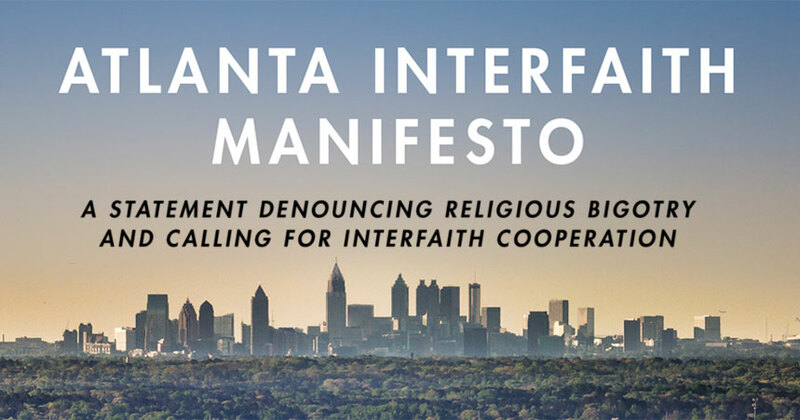 Celebrate Atlanta’s Broader Significance: We believe that our city has made invaluable contributions to the betterment of our nation, and we call on Atlanta to once again serve as a beacon to the country and the world, showing the power and promise of interfaith cooperation. 4. Take a stand: We pledge our willingness to speak out and stand against acts of hate and intolerance that threaten the very foundation on which our society was founded. 402 Rev. Dr. William B. Wade Jr.
383 Rev. Dan Matthews Jr.
360 Rev. Dr. Robert M. Franklin Jr.
270 Lawrence P. Vickers, Jr.
By endorsing this statement, we stand steadfastly behind the right of all Americans to embrace their various spiritual beliefs in an inclusive environment that is free of religious bigotry. In making this public statement, we offer no support for any political figure or for any specific legislative proposal. Rather, we reaffirm the importance of religious cooperation in which we, as Americans, respect each other’s right to worship, or not, as we please.